Here is the latest guidance from the DE on universal screening assessments, required by the third grade reading and retention laws, and students enrolled in home school assistance programs (HSAP) and dual-enrollment students. In short, the DE is now saying that districts should offer the universal screening assessments and services, but should not compel HSAP or dual-enrollment students to participate in the universal screening assessments or services. This entry was posted in DE, reading on December 11, 2015 by Karen W.
Last month The Gazette published Between the Lines, an article with reporting on Iowa’s third grade retention law by Andrew Phillips. One of the hardest things for me to grasp is what exactly defines a proficient third grade reader. In Iowa, it is a third grader who can meet or exceed the benchmark or cut scores on the universal screening assessment (not the Iowa Assessments or whatever end of year accountability assessment ends up being used). These benchmark or cut scores have been set based on a prediction that a child meeting at least that score will meet a proficiency cut score on a statewide assessment. Presumably these predictions are state specific, but that isn’t entirely clear. If that still seems a bit abstract (and perhaps, arbitrary), The Gazette offers a look at the fluency portion of the universal screening assessment in another article, Quiz: Are you smarter than a third grader? Note that the orange, blue, and green lines mark the words a third grader would have to read to or beyond to earn a passing score on the assessment in the fall, winter, and spring assessment periods. Are you confident that a third grader only reaching the word “blue” should be headed for retention, while a third grader reaching the word “with” shouldn’t be? I’m not. To be fair, I don’t see any claims to the effect that the cut scores on the universal screening assessments are valid for the purposes of determining retention in third grade. See here, here, and here. And yet, we are poised to use them for retention purposes anyway. Consider what that says about state-level education leadership in Iowa. ADDED: Current Iowa benchmark scores on universal screening assessments. This entry was posted in assessment, DE, gatekeepers, please send me the research, reading, snowday blogathon on November 21, 2015 by Karen W.
The DE issued a press release, for the Iowa Reading Research Center commissioned survey of Iowa summer reading programs, entitled Survey shows need for funding for summer reading programs. Just kidding. Despite survey findings that funding is the primary barrier for the majority of school districts not yet offering summer reading programs and the current school funding debates, the DE instead chose to emphasize a need for statewide standards or control with this title: Survey shows need for consistency in summer reading programs. The sixty-nine page report has quite a lot of information in it (though it is light on recommendations), but I think it is unfortunate the public library summer reading programs have been lumped together with summer school programs and other reading skills oriented community programs in this survey. Perhaps it adds to the inconsistency among programs surveyed: public library reading programs are focused on supporting a love of reading rather than teaching or maintaining academic skills, are less likely to offer formal assessment of reading skills, are unlikely to set academic goals, are unlikely to require attendance, and are not staffed with licensed teachers. But I hope it isn’t a sign that the DE and/or the IRRC are going to develop standards for public library summer reading programs. Encouraging kids to find reading for pleasure a worthwhile activity is a valuable endeavor and librarians, though not licensed teachers, are trained professionals well suited to helping kids find books they will like–or even love–reading. This entry was posted in DE, education funding, IRRC, reading, school funding on June 19, 2015 by Karen W.
The Iowa Reading Research Center has been tweeting more links to the IRRC blog lately. The blog seems aimed at driving parent traffic to the IRRC searchable collection of resources (which appear to all be links to other websites). I suppose the blog is meant to be drawing attention to useful information parents might not otherwise find on their own. However, it is disingenuously presented as a parent-to-parent blog when the author is, in fact, a literacy consultant for the IRRC. And worse, the blog is largely written from a faux-clueless parent point of view. I say faux-clueless because I refuse to even entertain the idea that a literacy consultant, for example, would need to learn that it is okay to ask questions at the library, is incapable of effectively using a library catalog to find books about robins, needs someone else to suggest the idea of pairing reading a book with watching a movie based on the book, or needs reminders of the importance of talking to her baby. This entry was posted in IRRC, parent blogs, parents, reading on June 19, 2015 by Karen W.
Have fun, start now are the guiding principles in Dan Willingham’s latest book, Raising Kids Who Read: What Parents and Teachers Can Do. Willingham focuses on three foundations of reading: decoding easily, comprehension, and motivation. These foundations are addressed by age groups, birth through preschool, kindergarten through second grade, and third grade and beyond. Willingham discusses what you might expect to be happening at school and what you can do at home. And, because it is Willingham, there are references to research, both what we already know and where further study could be helpful. This book is aimed at helping you help your child to see the value and pleasure in reading for enjoyment or entertainment. Basically, kids who read have a self-concept of themselves as readers (“reading is one of the things that I do”) and Willingham offers suggestions for helping your child build that self-concept as well as positive encouragement (it’s never too late to start!). If you want your child to value reading, schools can help, but you, the parent, have the greater influence and bear the greater responsibility. You can’t just talk about what a good idea reading is. Your child needs to observe that reading matters to you, that you live like a reader. I agree that many products (and advice) sold to parents may not be sound in how they approach reading instruction, but I am confident that that statement may too often be true with regard to materials (and advice) sold to schools as well. In other words, I’m less optimistic than Willingham that schools are mostly getting systematic phonics instruction right. Case in point: here’s a portion of a literacy consultant’s blogpost, on the Iowa Reading Research Center website blog, highlighting a video, “Reading Solution: Don’t Give Me the Answer”, from the IRRC Family Resources page. Let me suggest something different this parent could have said to her child instead. How about, “Griffin, each syllable in a word has a vowel sound. Let’s see if we can divide this word into syllables and try sounding it out again?” Having assisted Griffin in dividing “tickets” into two syllables (tick-ets), Griffin should have been able to sound out this word, not guess the word from the pictures (which, it should go without saying, won’t be a particularly good reading strategy in the long run). In chapter 5, I encouraged you to count on your child’s teacher to get him reading, but when it comes to knowledge building, you can’t exhort the schools and hope for the best. This work will fall to you. In this case, it wasn’t so much disagreement as discouragement about the general state of schools with regard to content knowledge that would cause Willingham to write this and what it means for local efforts to address the achievement gap. As we add more time to the elementary school day, I hope local school officials will take note that making time for building content knowledge (history, civics, science, art and more) is vital for supporting later reading comprehension (Chapter Six). There is one qualification to that conclusion. If your child’s school is considering moving to electronic textbooks, be at least a little wary. Publishers are working to improve electronic textbooks, but with the current offerings, the research is pretty consistently negative. The consequence of long-term experience with digital technologies is not an inability to sustain attention. It’s impatience with boredom. It’s an expectation that I should always have something interesting to listen to, watch, or read and that creating an interesting experience should require little effort. . . . We’re not distractible. We just have a very low threshold for boredom. But it’s not all bad news (e-readers can help make appealing reading material easily accessible) and Willingham offers a number of suggestions to encourage kids to choose to read. All in all, a worthwhile and engaging read, and a book I’d like to see local teachers and school administrators find time to read. *FWIW, I like the Montessori preschool writing to reading sequence of materials and activities. I also like Sound Steps to Reading (plus storybook) by Diane McGuinness. This entry was posted in Iowa Core, IRRC, parents, please send me the research, reading, the bookshelf on May 25, 2015 by Karen W.
Cut scores and proficiency labels. 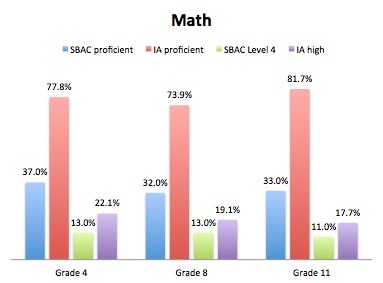 SBAC announced cuts scores for each of the four achievement levels that will be used for reporting student performance on the Smarter Balanced Assessments earlier this week. Education Week has coverage of the cut score announcement, the process used for setting the cut scores, and concerns raised about whether cut scores should have been set using only field-test data (PARCC will set cut scores after administering the operational test). “It’s really bizarre to set cut scores based on field-test data,” said one state education department psychometrician. “You can’t possibly project” accurately what proportions of students will score at the four levels of the test. He and other assessment experts said that field-test data are not good predictors of performance on the operational test because students are unfamiliar with the test, and often, teachers have had less experience teaching the material that’s being tested. And students might lack motivation to do their best on a field test, experts said. Education Week also has coverage about the debate over use and reporting of test scores, particularly reporting test scores in performance (achievement-level) categories as opposed to reporting scale scores. Vermont abstained from voting to set SBAC cut scores and outlined concerns about the use of performance categories, and the lack of empirical evidence for the cut scores, in a memo to SBAC governing states. 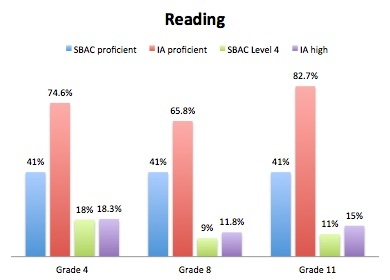 SBAC covered similar ground in a document titled Interpretation and Use of Scores and Achievement Levels. Even though the predictions about student performance on the operational assessments may be flawed (based on field-test data only, Iowa students may outperform–or underperform–the multi-state averages), I thought it would be interesting to compare predicted performance on the Smarter Balanced Assessments to reported proficiency data from the Iowa Assessments. I used SBACs performance predictions for Levels 3 and 4 (proficient) and Level 4 (college content ready at 11th grade) and Iowa Assessments intermediate and high performance levels (proficient) and the high performance level from the 2011-13 biennium (the most recent data reported by the state of Iowa). I chose grades four, eight, and eleven because those are the levels reported in The Annual Condition of Education Report (see pages 176-181). Have Iowa proficiency standards been set too low? Are the Smarter Balanced Assessments proficiency standards set too high? Are the predictions grossly inaccurate? Who knows, but if the Iowa Legislature chooses the Smarter Balanced Assessments we had better be prepared for much lower reported proficiency rates, at least in the early years. Just for fun: draft assessment tasks for the Next Generation Science Standards from Achieve (HT: Education Week). Iowa is expected to adopt the Next Generation Science Standards. If the Iowa Legislature chooses the Smarter Balanced Assessments, Iowa will need to choose a separate science assessment. This is a continuation of the conversation on the State Board’s priority on assessment. Possible ideas for Board positions and recommendations on assessment will be provided. Opportunities for interaction around these topics will be provided throughout. I guess we’ll just have to wait for the minutes to be posted following the January 22, 2015 meeting to learn more. 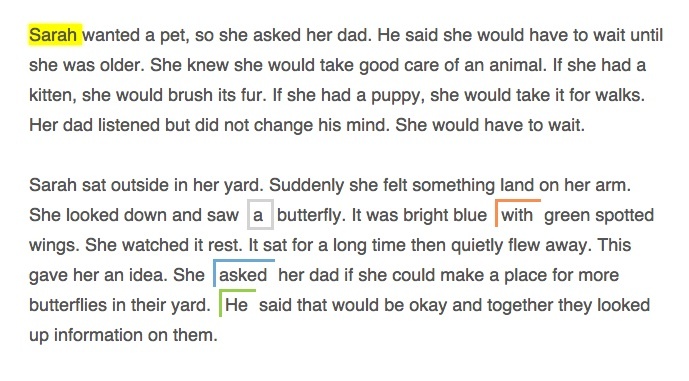 This entry was posted in assessment, college career ready, math, reading, SmarterBalanced, state board of education on November 22, 2014 by Karen W.
Still, it seems a valid question to ask whether this artificial type of reading is likely to be useful in students’ ongoing work in and out of the classroom. Except in very restricted academic settings — that is, among people who like close reading — it’s not obvious to me how this sort of reading will serve students well. Careful study of language, focus on the author’s words, assumption that rereading pays off: yes. Excluding knowledge outside of the text: no. So I was interested to find a video and other materials on close reading in an online collection of professional development materials meant to assist teachers in implementing the Common Core. Unfortunately, user agreements for that collection prohibit sharing of those materials on any other websites. Fortunately, the owners of the video have also made it available on YouTube, making it possible to share it with you here. This video shows portions of a lesson devoted to a close reading of the story of the inventors of Magic Rocks. Comments during the lesson, and in the companion video showing the class during an earlier close reading lesson (embedded below), indicate that the students have been closely reading a series of stories on the inventors of toys including Silly Putty, Twister, Lego, Mr. Potato Head, and Slinky. Students are apparently (according to the companion video) supposed to be determining “what character traits are essential to being an inventor” in addition to using their close reading skills. 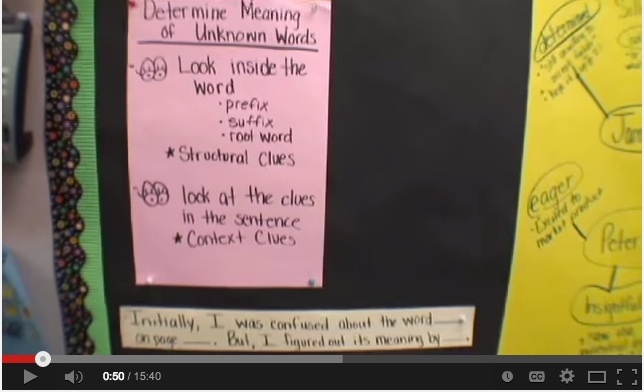 Although the teacher acknowledges the use of background knowledge during several points in these videos, these students are not being directed to use dictionaries (or glossaries, for that matter) to determine the meaning of unknown words (perhaps because they exist outside of the text?). This strikes me, as a person who still keeps dictionaries conveniently located near the places I tend to sit and read, as an enormous disservice to these students. This disservice is evident in the second video (1:34 to 4:33) in which the teacher pretends not to understand the word stabilizing but guesses at its meaning through the root “sta-” meaning to stand or to stay and the reading of several more sentences of the text indicating that ships pitch, plunge, and rock every which way. It is also evident in the nonsensical discussion she has with a student in the first video (beginning at 1:10) in which she leads the child to explain that he has determined that the word composition (used in the phrase “chemical composition”) means formula because the other words nearby include “study” and “microscope.” Umm, obviously. In any case, skilled use of a dictionary could resolve the matter of unknown words in short order while the students could be reminded to use context to choose which definition of a word the author meant (see, for example, the use of the word “pitch” above). But these videos raise other issues for me as well. Second, the fact that the students in these videos appear to be absolutely engaged by close reading seems to me to be a testament to the capacity of many children to be compliant. But these children are engaged with the close reading of what strikes me as absolutely trivial material. Multiple class periods devoted to the study of toy inventors is a waste of instructional time that could be devoted to much less trivial content. This is a real problem when skills are elevated over content. It may also be a sign of disrespect to child readers, who may have been assumed to be incapable of interest in more substantial topics in history, including the biographies of inventors whose inventions have substantially affected human history and/or civilization. This entry was posted in CommonCore, reading on September 28, 2014 by Karen W.
Nothing on this site is intended as legal advice. Click these links to look for, view, and comment on Notices of Intended Action by the DE or all state organizations. Click on this Iowa Legislature link to search for a bill or an amendment in the House or Senate by number or keyword. At the link you may also find your legislator, find the House and Senate tentative debate calendars, and follow House and Senate Floor Action by text, live streaming audio, or live streaming video. Can Teachers Increase Students' Self-Control? Math Education in the U.S.